Home / Militaria, collectibles, insignia, buttons etc. / 1918 civil war era cartridge knife. Original handcrafted knife, made in to 7,62mm russian cartridge, and a nickel mantle bullet. This kind of "puhdetyö" handcrafted knives were made by Red and White prisoners, and some soldiers in more quiet front, just to pass the time. 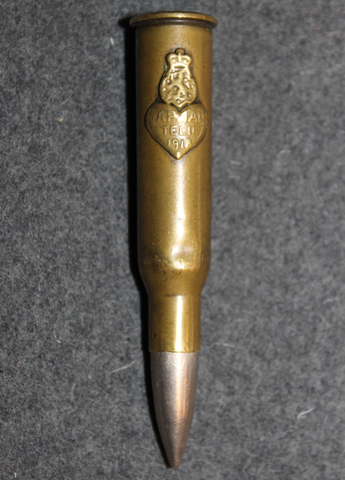 This specimen in one of the finest examples of this kind of knife, there is an engraving on the heart below the Finnish Coat-of-arms with text Vap. taistelu 1918, meaning the fight for freedom 1918. The casing is made by Remington in 1917, bullet is typical nickel of the era. There is no certainty if this specimen was made by Red or White soldier or prisoner. Delivery of the item may be held by customs as the casing is part of a cartridge, in event of confiscation of destruction of the item, hastur.fi may not be held responsible, and buyer is not entitled to repayment, these terms are accepted by buyer once the invoice is placed. Delivery in track and trace methods only.